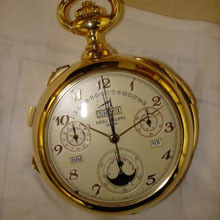 A spectacular and unique, keyless three-barrel, double dial, astronomical and astrological 18K yellow gold watch with sidereal time, second time zone, time of sunrise and sunset, equation of time, perpetual calendar, century leap year correction, century, decade and year indication, four year cycle indication, season, equinox, solstice and Zodiac indication, star chart, phases and age of the moon, date of Easter indication, split-seconds chronograph, hour and minute recorders, Westminster chime on four gongs, “Grande and Petite Sonnerie”, alarm, up/down indicators for the going and striking train, three way setting indicator, winding crown position indicator, thermometer and Tourbillon regulator. Accompanied by the Extract from the Archives and a fitted hardwood box. C. Four-body, "bassine", polished. D. Front: cream with applied yellow gold Breguet numerals, retrograde date sector, hour and minute recording dials combined with the power reserve sectors for the going and striking trains, moon phase, year, month, day and four-year cycle apertures, second time zone, thermometer, winding crown position indicator, alarm indicator, outer 1/5th seconds scale with five minute/seconds red Arabic markers and subsidiary constant seconds. Blued steel and yellow gold hands. Back: Silvered with hours of sidereal time, date of Easter sector, sun-rise and sun-set dials, subsidiary sidereal seconds, equation of time sector, sun hand and aperture for the star chart. Blued steel and yellow gold hands. M. Cal. 89, three barrels on four levels, maillechort, 600 grams, fausses cotes decoration, 126 jewels, 1728 parts, straight-line lever escapement, Gyromax balance, blued-steel Breguet balance spring, adjusted to heat, cold, isochronism and five positions, tourbillion regulator. Dial side main plate: mechanisms for the chime, alarm, 12-hour recorder and the power reserve indicators for the chime and movement. Reverse main plate, mechanisms for mean time, the chronograph, the 30-minute recorder and the tourbillon regulator. Plate 2: Mechanisms for sidereal time, the season, solstices, equinoxes and solstice, the times of sunrise and sunset, the equation of time, the date of Easter and the star chart. Plate 3: The mechanisms for the secular perpetual calendar, the second time zone, the phases and age of the moon and the thermometer. Dial, case and movement signed. Diam. 88.2 mm, 41.07 mm thick (with the crystals), total weight 1100 grams. Yoshiho Matsuda was born in Tokyo, Japan, where he graduated from the Economic Department of the prestigious Keio University. The Matsuda Collection is one of the world's finest private collections of Patek Philippe watches and Ferrari automobiles. Mr. Matsuda's initiation to Western culture came when he lived in the United States, where he learned about collecting artwork, paintings and watches. One of the pioneers of Hakone's car museums, Yoshiho Matsuda built the now closed Porsche museum in 1981. Following its closing, he went on to open the Art City Museum of Art in 1996, which included artworks by the likes of Warhol and Lichtenstein, as well as glass art. In 1998, this evolved into the current Ferrari Museum of Art, where a portion of Mr. Matsuda's collection of art, Ferraris and watches is on display. Mr. Matsuda has been the leading contributor to spreading knowledge of European classic and historic cars and Swiss watches in Japan. The Calibre 89 is an open-faced astronomical clockwatch with two main dials. It was made in four unique examples; one each in yellow, pink, and white gold, and one in platinum. By accepted reckoning, the Calibre 89 has 33 complications which fall into five main categories: timekeeping, the calendar, the chronograph, the chime and the operational functions. The Calibre 89 was built by a team of watchmakers at Patek Philippe, Geneva, to mark the company’s 150th anniversary. Preliminary calculations and designs were started in 1980, a working prototype was ready in July 1988, and the watch was finally completed in April 1989. The standards of manufacture are commensurate with the requirements of the Geneva Seal. This poincon or hallmark is awarded to Geneva-made watches that meet the standards of manufacture described in the laws of the Republic and Canton of Geneva of November 6, 1886, amended on October 23, 1959, governing the inspection of watches. The present watch is the first Calibre 89, it is made in yellow gold and was sold by Antiquorum in our April 9, 1989 sale, “The Art of Patek Philippe”, as lot 301. This piece, and the other three watches, were purchased by a single Royal family. The collection was dispersed in the early 2000's: this yellow gold watch was bought by an important collector and was in his private museum; the pink gold watch was bought by an important Italian collector; the platinum watch was bought by a Middle-Eastern Royal family, to be placed in their private museum; the white gold watch was the last to be offered or sale and was included in the Antiquorum auction celebrating our 30th anniversary on April 24 & 25, 2004, lot 301. The movement of the Calibre 89 is on four levels contained on three plates made of maillechort - an alloy also known as German silver. The 126-jewel movement is driven by a single mainspring barrel and regulated by a tourbillon regulator. Two other mainspring barrels power the chime and the alarm. The movement has a diameter of 71.5 millimeters, including the mountings for the plates, and is 28.05 millimeters thick. It weighs 600 grams (19.29 oz). On this side of the main plate are found the mechanisms for the chime, the alarm, the 12-hour recorder and the power reserve (up-down) indicators for the chime and movement. The movement contains 1278 parts, including 332 screws, 184 wheels, 61 bridges, 68 springs, 126 jewel bearings, 24 hands, eight discs, two main dials and 429 composite mechanical components. The mechanisms for mean time, the chronograph, and the 30-minute recorder, as well as the tourbillon, are mounted on the other side of the main plate. The tourbillon can be seen on the left at about 8 o’clock. The functions of the watch are controlled and set by 12 external slide-pieces, push-pieces and winders. The second plate holds the mechanisms for the functions of the sidereal dial, namely: sidereal time, the seasons, solstices, equinoxes and zodiacs, the times of sunset and sunrise, the equation of time, the date of Easter and the star chart. The crenellated cam for the date of Easter, surmounted by its snail cam, can be seen just below the engraved bridge at the top. The mechanisms for the secular perpetual calendar, the second time zone indicator, the phases of the moon and the thermometer are supported by the third plate, which faces the mean time dial. The secular perpetual calendar mechanism is under the disc bearing the names of the months at the right of the movement. The century wheel and its satellite that completes a revolution every 400 years, are hidden by the bridge plate at 3 o’clock. The tourbillon regulator, invented by Abraham-Louis Breguet (1747-1823), compensates for errors arising when the watch adopts different positions in relation to the prevailing gravitational field. The design requires the balance wheel and escapement mechanism to be mounted in a cage which itself revolves, usually at one revolution per minute. The tourbillon ensures that the load is evenly distributed on all sides of every bearing in the regulator, largely irrespective of the changing position of the watch. In the Calibre 89, improvements were made to Breguet’s original concept. Instead of placing the tourbillon regulator in its traditional position as part of the fourth wheel of the main drive-train, the fourth wheel engages the cogged rim of the tourbillon’s cage. The fourth wheel of the train not only drives the seconds hand and the tourbillon, but also the chronograph and the 32-wheel mechanism of sidereal time. The principal elements of the cage are made of titanium. The cage and escapement are made of 54 pieces and weigh 0.73 grams. The cage revolves once every two minutes. The escapement is of the straight-line, Swiss lever type. The escape wheel has 20 teeth. The balance wheel is of the Gyromax type with variable inertia, vibrating at 18,000 beats an hour, or five times a second. The balance wheel and its inertia blocks are cut from 14K gold. The Gyromax is a monometallic balance wheel having inertia blocks arranged around its circumference. The inertia blocks, which are slotted gold weights mounted on pins, provide an elegant means of adjusting the balance wheel, for they may be turned to increase or reduce the effective radius of the balance wheel at one or another point on its circumference. The Gyromax balance wheel enables the regulatory mechanism of the Calibre 89 to be adjusted with greater precision and convenience than regulators equipped with the conventional index. The hairspring is free-sprung with a Breguet overcoil. The 19 pieces making up the balance wheel assembly, with its arbor and mounting, weigh 0.98 grams. The Gyromax balance wheel was invented by Patek Philippe & Cie, and is protected by Swiss patent No. 261431 of May 15, 1949 and Swiss patent No. 280067 of December 31, 1951. The open-face case for the Calibre 89 complicated watch is cut from three pieces of 18K yellow gold. The case, in the Geneva “bassine” style, consists of a central case band which supports the movement, and two bezels in which the protecting glasses are set. The pendant and winding-stem are at 12 o’clock according to the pattern established by the French watchmaker Jean-Antoine Lépine and which bears his name. The neck of the pendant is a boss that forms an integral part of the case band. The two main dials are made from discs of 14K gold, with a vapor of silver condensed on their surfaces to form an opalescent coating. The dials are mounted directly on the second and third plates of the movement. The glasses are made of corundum (sapphire) crystal and will resist scratches from virtually every common material except diamond. They are in the shape of a circle cut from the surface of a hollow sphere. The case has a diameter of 88.2 millimeters and is 36.55 millimeters thick without the glass, and 41.07 millimeters thick with the glass. It weighs 500 grams (16.075 oz). The total weight of the watch is 1100 grams (35.365 oz). The hours, minutes and seconds of mean time The hours and minutes of mean time are recorded by blued-steel hands in the Breguet style against a scale marked in 18K gold Breguet numerals applied in relief. The seconds are indicated by a straight, small seconds hand rotating in a subsidiary dial at 6 o’clock on the solar dial. Mean time may be set by pulling the winding crown up to the position B and moving the slide-piece at 11 o’clock to CL. The hands are then made to advance by turning the winding crown anti-clockwise. The unit of time according to which most clocks and watches record time is the mean second - an 86,400th part of the mean day. The mean day is a constant unit of time calculated from the average length of 365 apparent solar days. The length of an apparent solar day, which is the period between the sun’s successive transits of the observer’s meridian, changes according to the Earth’s position in its elliptical orbit, and is thus not suitable as a basis for timekeeping. The time in a second time zone A gold Breguet hour hand indicates the hours of a second time zone against the main scale of the solar dial. The independent hour hand is mounted on the canon pinion of the hour wheel, but it can be moved forwards in increments of one hour with each pressure on the push-piece at 11 o’clock. The mechanism for the independent hour hand is based on a design patented in Switzerland by Patek Philippe & Cie on July 31, 1959 under the number 340191. The independent hour hand enables a traveler to adjust his watch according to the standard time in different time zones without advancing the minute hand. The equation of time is indicated by a blued steel hand against a penannular scale at 12 o’clock on the sidereal dial. The scale ranges from minus 17 minutes to plus 17 minutes. The movement of the hand is governed by a cam driven off the mechanism for sidereal time. The equation of time indicated corresponds to the season shown by the sun hand, which is also driven by the sidereal time mechanism. The equation of time is the difference in minutes between mean time and apparent solar time. It is a conversion factor that ranges from plus 14 minutes and 59 seconds (on or about February 12) to minus 16 minutes and 15 seconds (on or about November 3). On or about April 15, June 14, September 1 and December 24, the value of the equation of time is zero. A knowledge of the equation of time is necessary for navigators who observe the altitude of the true sun at a time noted from a watch keeping mean time. The sidereal time is shown on the sidereal dial by blued-steel hands in the Breguet style against a 24-hour scale. The sidereal seconds are indicated by a straight, small seconds-hand revolving in a subsidiary dial at 12:00. The 32-wheel movement for sidereal time is driven from the fourth wheel of the main movement. The conversion of mean time to sidereal time is made through a reduction train which results in a sidereal second equal to 0.9972677 of a mean second in the Calibre 89 watch. The sidereal second recorded by the Calibre 89 is thus slightly shorter than the true sidereal second, which is 0.9972696 of a mean second. The sidereal time shown by the Calibre 89 gains on mean time at a rate of 3.94512 minutes a day, which means that it will have gained a full 24 hours in a year. Sidereal time may be set by pulling the winding crown to position B and setting the slide-piece to CS. The hands of sidereal time are advanced by turning the winding crown anti-clockwise. Advancing the hands indicating sidereal time also causes the sun hand and the star chart to advance proportionally. The unit of sidereal time is the sidereal day, which is the period between the successive transits of the observer’s meridian by the vernal equinox, also known as the first point of Aries. The first point of Aries, being a hypothetical point, is at an infinite distance from the observer. As a point of reference it enables a more regular scale of time than that afforded by using the sun as a reference. Sidereal time is of interest to the navigator who needs to determine the hour-angle of a star. The hours and minutes of sunrise at Geneva (latitude 46° 11’ 59” north), corresponding to the time of year indicated by the sun hand, are shown on a clock face on a subsidiary dial at 16:00 on the sidereal dial. The hours and minutes of sunset are shown on a similar clock face at 08:00. The indication of the time of sunset and sunrise is governed by cam-based mechanisms. The cams can be replaced for latitudes other than that of Geneva. The times indicated are within five minutes of true sunset or sunrise, which is when the sun’s upper limb is on the true horizon of an observer at sea level. True sunset or sunrise is normally corrected to allow for the refraction of the earth’s atmosphere.